There's a resturant around town that makes an awesome vegetarian taco. My family and I found that we were wanting to eat these all the time. At around $2.50 a taco I knew we better try to make them to save some money in our pockets. It was not really hard to find out how to make them. Pinterest has everything. The only thing I had to decide was to whether learn how to make Pico De Gallo from scratch or buy it in the store. 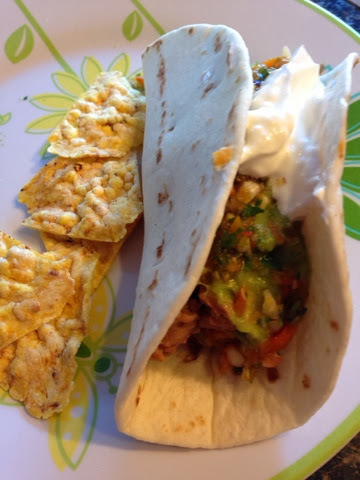 So with the start of making my own Pico my family has came up with a sweet potato soft shell taco, to us it is awesome and cheaper on the pocket book. To make these wonderful tacos you bake your sweet potatoes until they are soft and ready to eat. The smaller the sweet potato the better. But don't worry if you have a big sweet potato you can still use it. Once the sweet potatoes are done you are ready to make your tacos. I like my soft taco shells warmed so I throw them in the oven for just a few minutes. Once my taco shell is warmed. I place the sweet potato with the skin taken off in the shell. If your sweet potato is big you can cut it in half. On top of the sweet potato add refried beans. Then add guacamole, pico de gallo and sour cream.